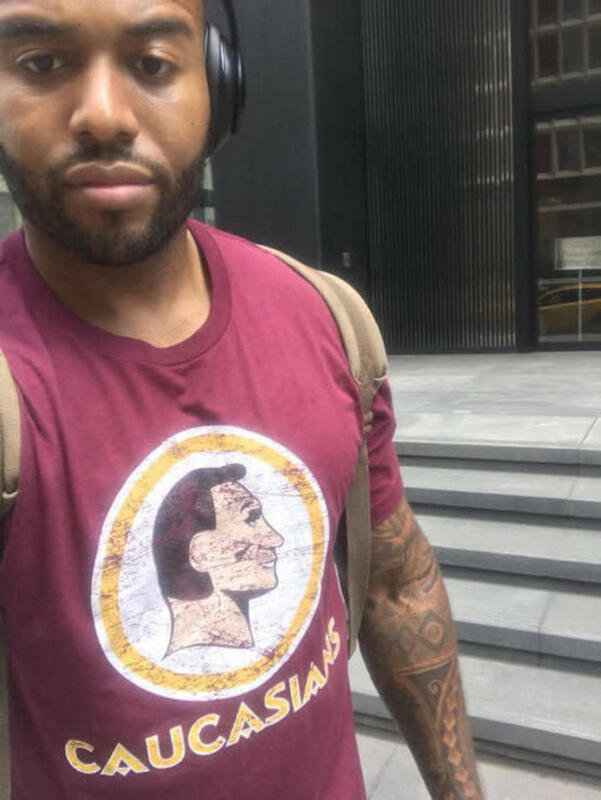 A man who launched a social experiment by wearing a T-shirt with a "Caucasian" logo to mimic that of the Washington Redskins says the effort has revealed racial bias. Joseph's newest endeavor was more low-key. On Tuesday, he tweeted a photo of himself wearing a red T-shirt emblazoned with the word "Caucasian." The shirt mimics the logo for the NFL's Washington Redskins, whose name and emblem of a Native American character has been called "racist" and "offensive" by both players and fans. "I wanted to see how people responded to the shirt - while there's nothing derogatory about the word 'Caucasian,' there's a certain privilege among some white people who haven't been challenged on certain aspects of racism," Joseph tells Yahoo Lifestyle. Joseph says the shirt caused a reaction every few minutes as he walked through the streets of New York City. "Still, no one tried to have a conversation," he tells Yahoo Lifestyle, adding that the woman's response seemed to underscore a general acceptance of ingrained racial biases. "Basically, I was being shamed as a black person for wearing a non-disrespectful shirt with a white person logo on it," tweeted Joseph. "But people wear apparel and jerseys with logos depicting things such as a Native American and call them 'redskins' … whew chile, the hypocrisy and privilege!" Joseph tweeted that he was surprised by the negative reactions, given how many other images appropriate or otherwise disrespect certain minority groups. "But it goes to show how fickle and hypocritical people can be," he wrote. He's urging his followers to replicate his effort, tweeting, "I'd be interested to see more people wear shirts and apparel such as this to make the point and see how the people who have racist car decals, shirts, jerseys, etc., respond when the tables are turned (and still not really)." Welcome to the typical American Syndrome. Did you received certain stares from someone of your own race? Yes? No? Some people in general in America is a bit racist. Regardless of acknowledgement to this fact. Try this in Mississippi. Then your will get to understand the makeup of a Real Racist. Wow, what a scientific experiment! With pre-conceived notions of how people will react to his trying to emit a reaction, he confirms that there are negative reactions, even though "no one tried to have a conversation." Inside his mind he had already determined the outcome.